This was the sentiment echoed among industry analysts, to the discomfort of early investors in Sirius, the now-famous pioneering company of satellite radio. The early days were rocky, and in 2008 the company fought to right itself as the overall global economy entered a tailspin. All throughout, the company was led by a team that had a clear vision of what it wanted to accomplish; a subscriber-based model of content delivery for radio. "We view Sirius stock as a complete risk with no compelling reason to even consider buying shares," Moran said. "Subscriber growth is shrinking rapidly due to lack of consumer interest and record low auto sales. There is not much hope the company can convince buyers they have a viable financial model." And when a company is obviously attempting to achieve something that’s never been done before – a satellite radio subscription revenue model was one of those – it’s almost too tempting for some to take potshots from the sidelines. Sirius was fearless in taking massive risks to achieve what they needed; there was no historical precedent for how to manage its kind of business. Despite being strapped for capital, they managed to sign several headliners, including Howard Stern. 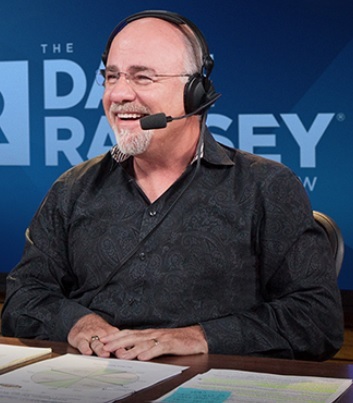 They've continued this strategy of hiring 'anchor' celebrities, eventually signing many more, including Dave Ramsey. Like Sirius, Ripple is aiming high despite their critics: They are in the process of transforming the global payments infrastructure using open standards. In an age when we can send information to the International Space Station and back at the speed of light, it still takes days to transfer value across borders using the archaic SWIFT messaging rails. Ripple is changing this with their technology offerings, and in the mix is XRP, a digital asset that is specifically constructed to support global commerce and cross-border value transfer. During its early years, very few in the crypto market – and in the traditional financial sector – believed that Ripple’s ambitious goal was achievable; after all, SWIFT has gone unchallenged in its role for over forty years. 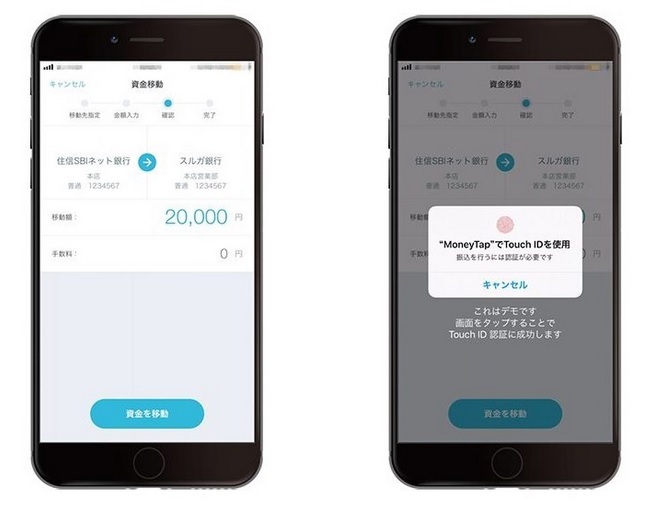 It is in this historical moment of uncertainty that we live, along with the rare opportunity to actually witness a company about to do the impossible; and the evidence is now quite apparent that Ripple is not only succeeding at its mission, but that the remittance and banking industry are pounding at the door to sign on as new members of RippleNet. Like you, I own XRP. I’ve been watching and paying attention to the increasing numbers of news stories covering this fintech wunderkind as it goes from one country to the next and establishes new corridors for liquidity. From these numbers, we can safely say that the market is testing its elastic lower ranges before the next bull run. From what I’ve seen of the crypto markets, these fire sale prices for crypto won’t last long – and when the time comes, this time period will most likely be looked upon as the last, best opportunity for the average investor to sneak into the crypto market. In addition to the overall market ups and downs, however, there are some that speculate on mass media causes for market behavior – and those crypto analysts are convinced that the positive news coming from the G20 summit of central banks has something to do with the latest rally. Before we delve into the good news coming from the most recent meeting of the G20 group of nations and their central bank organizations, we need to inform readers about the basics. First off, what is the G20? The year was 2008, and the original group was expanded to include new countries, bringing the total number represented at the annual meeting to twenty instead of the original eight. 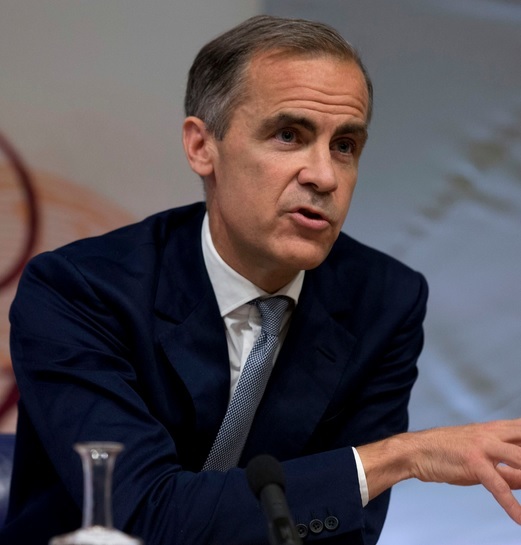 Each year, this group of central bankers meets to discuss various topics, and it’s a focal point for political protests; the policies discussed at the G20 can have far-ranging consequences for entire markets, as we’ve seen with the crypto market recently. It was welcome news to the crypto markets, and the valuations for the next two days reflected this positivity. To some extent, I’m quite satisfied with a large portion of the mainstream news coverage of Ripple and XRP. It seems like the message is being communicated very effectively – either through back-channel discussions that resulted from the SWELL conference last year, or through public-facing news articles via Forbes, CNBC, TechCrunch, and others. What’s so exciting about this highly-respected journal is that it chose to cover one specific deal that Ripple inked recently: Cambridge Global. Cambridge has over 13,000 clients and processes $20 billion in transactions every year. And they plan on using XRP. “However, Cambridge wants to lower costs and reduce the time it takes to make financial settlement on cross-border transactions while providing more comprehensive data to accompany settlement. That won’t happen with any legacy systems for cross-border payments. While I don’t need an independent news organization – no matter how well respected – to inform me of Ripple and XRP’s value when it comes to cross-border value transfer, it’s great to see that recognition is occurring for the purpose of informing potential Ripple customers in the conservative world of banking and finance. On the one hand, crypto investors can be skittish about regulation news, but on the other hand, if establishing concrete rules and guidelines clears the way for Ripple to continue on its mission of transforming worldwide payments with XRP, then we should welcome these news items. #2 has to do with the concept of a licensing framework, whereby a government agency – no matter which level of government – has its say. When a business has to go through the process of obtaining a license, it is much less likely to jeopardize losing the very license that enables it to conduct business. Coincidence? Personally, I think this move by China’s regulatory bodies is a direct result of momentum that has clearly been building behind Ripple’s strategy of closely advising the worlds’ central banks. Remember, Ripple has participated in groups formed by the IMF, has hosted a central banking summit, and has also hosted a delegation from China’s central bank – all within the last twelve months. To me, China’s decision to opt for a licensing model is proof positive that Ripple’s efforts are now bearing fruit. My guess is that Ripple is already moving to secure one of the licenses that China is going to create for new fintech firms; 2018 is shaping up to be a year where governments are honestly examining blockchain technology with an eye towards fostering innovation. Liquidity for the entire crypto market is well below the all time high mark set in early January, however, the numbers are still above most recorded points in 2017. These current volume doldrums are a symptom of confidence slowly being reclaimed by crypto investors after the disruptive first quarter downturn. Most crypto analysts that I know – be they professional or amateur – indicate that we’re at a point where very strong support has been encountered; I’ll leave the day-to-day predictions about price movements to others that are much more skilled than me at technical analysis, but I sense that the entire market is more than ready to move onward and upwards in the second quarter of 2018. A Polish exchange called BitBay decided to add XRP to its coin listing on March 18th. 17 While BitBay doesn’t currently handle a lot of volume, it has made one decision that may serve to enhance its usage in the future: It supports direct XRP/USD and XRP/EUR fiat pairings. 18 This is a smart move by the exchange operators, as some other more high-volume exchanges have yet to add direct fiat/XRP configurations. I predict that as 2018 moves forward, Bitcoin will quickly lose its market share to XRP as the digital asset for quickly moving value into and out of exchanges. After all, who wants to wait an hour when they can transfer value in under four seconds? 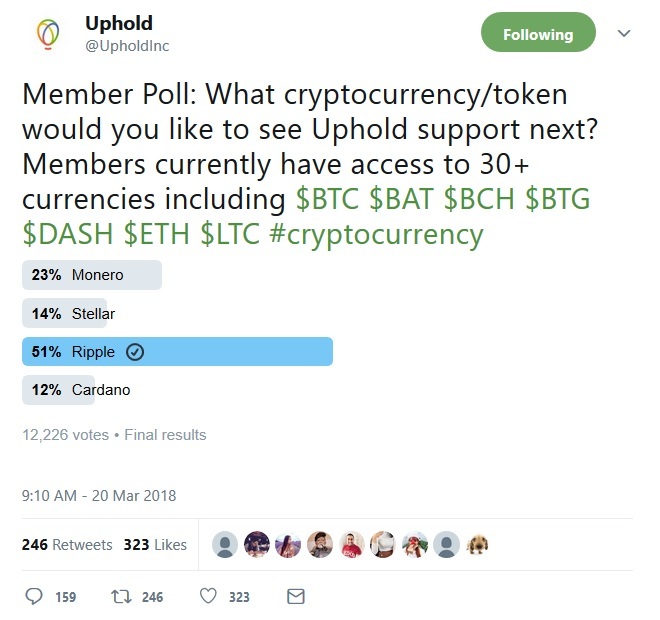 It will be interesting to see what new information emerges from Uphold regarding the schedule of integrating XRP into the mix. Ripple announced on Friday that David Schwartz' meetup in Hong Kong was not just a one-off occurrence - it's part of a scheduled two week tour. His plan is to participate in panels, lead a workshop and attend various meetings throughout Asia; this includes venues in Japan and South Korea. Next on the tour? 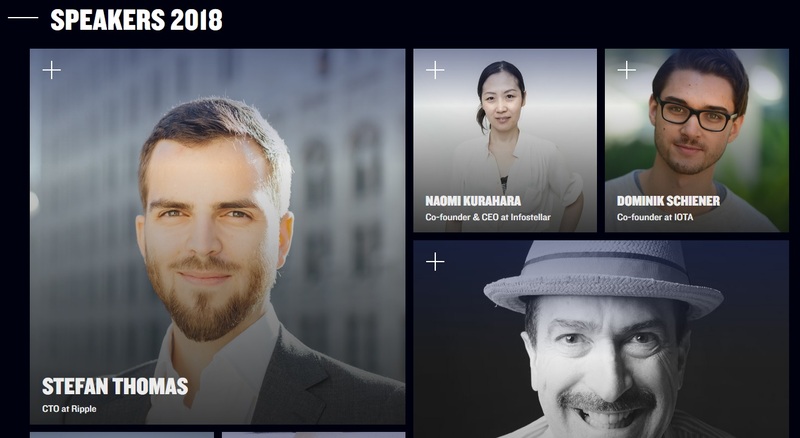 Tokyo, where he'll be joined by Stefan Thomas, Ripple's Chief Technology Officer, to attend Slush. Slush is a very popular series of worldwide conferences that serve to join investors with new technology startups. While Ripple may have been considered a startup in the past, their current situation is reversed. I predict that they'll be scouting for possible new acquisitions or investments similar to Omni. Ripple has its choice of emissaries for connecting with Asian XRP fans, developers, and entrepreneurs, but when they send David Schwartz and Stefan Thomas - two original Ripple insiders - it's a sign that they are aiming at this market with their primary resources. Every couple months, it’s good to take a look at the statistics of the XRP Ledger to see how adoption of XRP by investors and other stakeholders is proceeding – sometimes these numbers offer a surprising glimpse into larger patterns of use. The minimum number to be included in the elite XRP "one percent" club is now roughly 73,000 XRP. This minimum number to be included in the top one percent is indicative of dilution due to adoption by more and more investors. The first time I tracked this number, it was very large: over 200,000 XRP. Then as we kept watch, it gradually decreased by a factor of three over just five months. Should investors aspire to this level of XRP investment? Each person's situation is unique, and they have to make a determination about where they put their investments, hopefully taking the advice of trained professionals (which I am not). However, if you do aspire to it someday, keep one thing in mind: While this may just be a fun statistic to quote, there might be a day very soon where this 1% translates into the classical notion of "the one percent" - the upper echelons of personal net worth. Sirius XM is an example of a business that kept going even when obstacles seemed insurmountable. In my opinion, this similar moment is now in the rear-view mirror for Ripple. Their steady, methodical and exacting work in cryptography and decentralized architecture has set the stage for a new era. Whatever evidence you look at; wallet statistics, numbers of businesses and banks piloting xRapid and XRP, the increasing number of exchanges listing XRP with fiat pairings, the accelerating adoption rates of banks using Ripple technology, the number of funded wallets created in the span of three months, or the coverage of Ripple and XRP by news organizations, it’s becoming plainly clear what is happening. While this version of events may not fit into the vision of some narrow thinkers, the key point is to not short-change yourself of the opportunity to own a piece of history as it’s evolving in front of you. Crypto investing is not just a past-time for the young and technically-astute; it’s available to anybody with a computer, mobile phone, and an Internet connection. Sometimes investment choices are difficult for new market entrants to evaluate, but in the case of XRP versus any other digital asset, Ripple has made it abundantly clear which one has the most powerful organization championing adoption.